Tonight is Relay For Life. Tonight, I will celebrate all the progress we’ve made in the fight against cancer. Tonight, I will remember loved ones lost. Tonight, I will fight back against the disease – by raising money & raising awareness. Twenty of my closest friends and family and I will gather together, along with about 400 other participates, to walk the track all night. To do what we can to help create a world with less cancer. And one day in my lifetime, a world with no cancer. Please do what you can, too. Support Relay For Life by purchasing a print of one of my photos. This is your last chance for 2013. 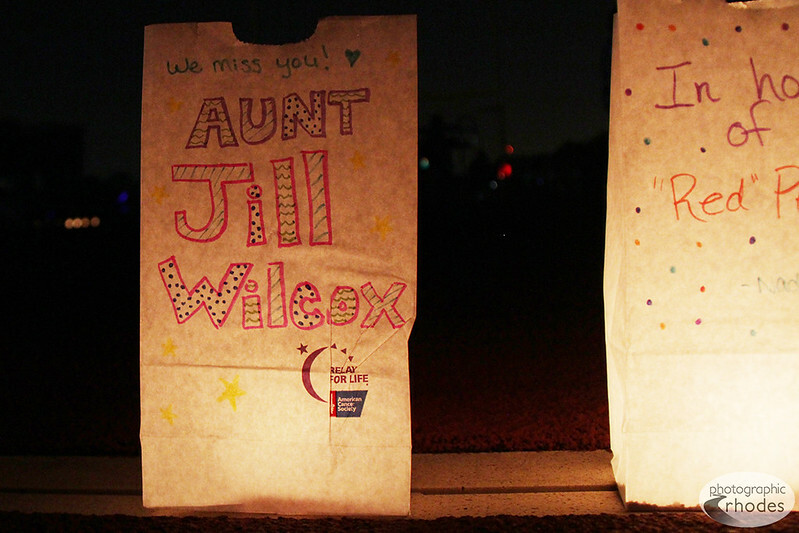 A luminaria lit to remember my Aunt Jill, who passed away from pancreatic cancer almost 3 years ago.